Sudden Oak Death is in the news. A number of the national and regional news programmes have recently carried reports of the felling of larch trees in the South West. Sudden Oak death is caused by the fungus Phytophthora ramorum – a primitive, but effective, parasitic fungus. The term sudden oak death is somewhat misleading in that the fungus attacks many types of tree including larch, horse chestnut, sweet chestnut, ash and also shrubs such as Viburnum, Camellia and Rhododendron. It has also been found on heathland plants such as bilberry (Vaccinium myrtillus). It was first recorded growing on a mature tree in the UK in 2003 – a southern red oak (Quercus falcata). In California and Oregon, Phytophthora ramorum has been responsible for the death of many millions of oak trees. Another species Phytophthora kernoviae can also infect plants , resulting in the same symptoms. There is some evidence that this species may grow and sporulate more rapidly on Rhododendrons than P. ramorum in the U.K. The fungus infects the leaves and shoots of ornamental shrubs but does not necessarily kill these plants. Symptoms include die back, leaf blackening and wilting of the shoots. However, on infected trees the symptoms may be more pronounced. 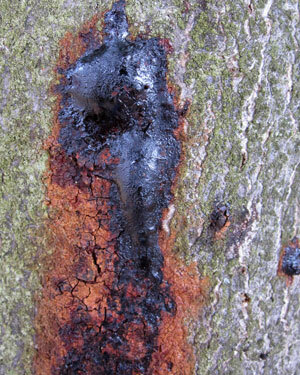 A bleeding canker or tarry spots may develop, where liquid exudes from the infected bark. Removal of the outer bark reveals necrotic (dying) tissues beneath. When the phloem is damaged / diseased then the plants ability to conduct and distribute sugars and other organic compounds is severely impaired. Infected plants and trees need to be removed as the disease / fungus spreads by air-borne spores. The wood from such trees needs to be removed, burnt or processed into wood products (biofuel). Detailed advice on the management of Phytophthora can be found here. 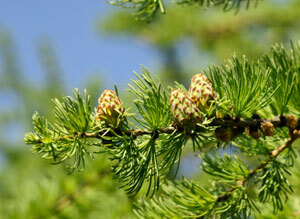 Many larch trees have been affected in the South West and the Forestry Commission is removing infected trees in the area. Unfortunately, the spores seem to have been carried across the Bristol Channel and some infected trees have been found in parts of South Wales (a map of the distribution of P. kernoviae can be found on the Forestry Commission site). In addition to the work of the Forestry Commission, the National Trust is actively tackling the problem; for example, clearing Rhododendron ponticum from its land / properties, as it is a host for the parasite. Rehydrated Lime mixed with water, then applied directly to the oozing area in a thick paste will slow the spread. Yes large trees require a large amount of Lime and effort to cover the entire tree, but it is worth the effort rather than wholesale slaughter of our trees. Regular applications can nearly eradicate it. I’ve been using this for years in Oaks and Conifers with great success in controlling and preventing this pathogen. that gives lots of information about the disease and susceptibility of various species. Could the Phytophthora attack a Mulberry tree? My 8 year old tree is dying as I watch!! Ive noticed lots of spotted laural dying in my Town in Cornwall. looks like the same disease to me . Woodland Heritage have recently launched an appeal to raise funds for vital research into the causes and to find a way to understand and tackle this disease. Now I know why the government wants to sell our forests. I’m currently cutting rhododendron in an infected area, where I volunteer. I put the 30″ logs into plastic bags before taking off site and burning at home. How safe is this? I’ve noticed this a lot in all over SW England especially on Horse Chestnut and now Oak in London – Highgate Woods, as well as Oaks in Chislehurst. An ornamental Bay seemed to have something similar too? Could it have anything to do with the clearing of rhodedendrons and the parasite needing to find a new host? We have noticed a lot of this in our local park, I’ve been trying to figure out what was happening to them for a while now, is there anyway to resolve the issue without cutting down a whole tree? Seems such a shame to waste them.